Let’s step through this step-by-step. To understand how this works, you have to understand the concepts of MPF displays and widgets. What’s actually happening under the hood is that you set up two MPF displays. The first is the “window”, which is the display that represents your on-screen window. This should be set to the size of the screen window at the native resolution of the monitor or LCD where it’s being shown. 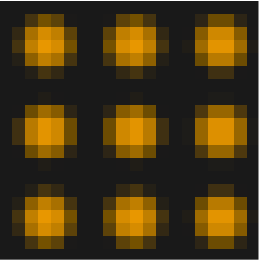 In the example above, this is 800x600, but on your actual machine, it will probably be something like 1024x768, 1280x1024, 1600x1200, etc. The second MPF display represents the virtual DMD itself, and you set that to the number of pixels (or dots) you want to be drawn in your window. 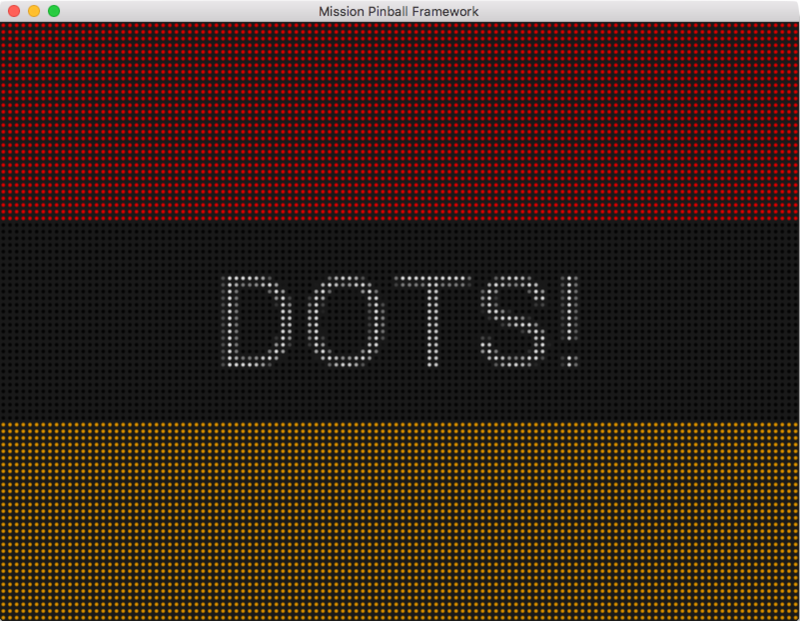 In the example above, this is set to 120x90, meaning the virtual DMD is 120 dots wide and 90 dots tall. You can make this anything you want. The key to remember is that the parent window will be using its pixels to draw the individual dots that make up the virtual DMD. So a smaller DMD resolution means the window has more pixels to use per-dot, resulting in a better overall image. 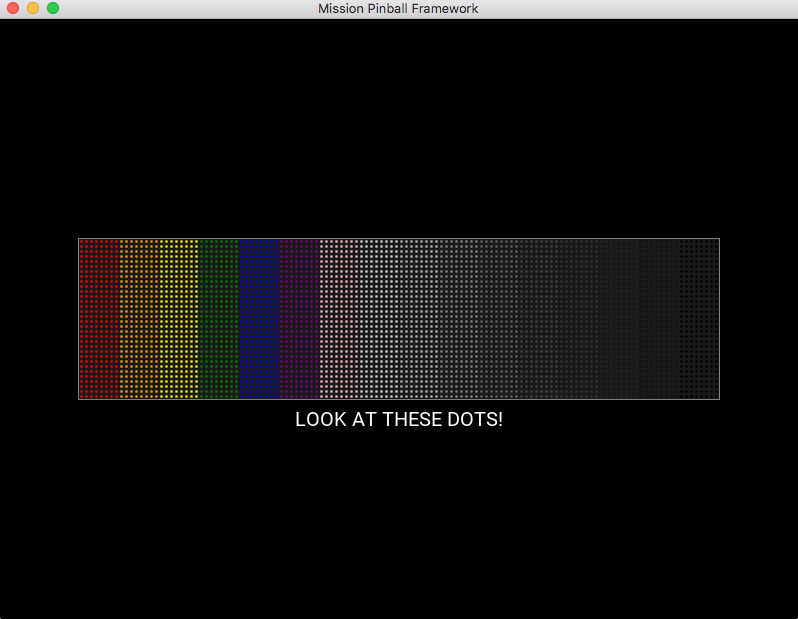 This works because there is about a 6x6 grid of pixels in the window for each virtual pixel in the DMD. But if you increased the virtual DMD to 400x300 (instead of 120x90), that would mean you only had a 2x2 window area to render each pixel, and it wouldn’t really work because you can’t draw a circle with space around it in a 2x2 pixel. Also note that we added default: yes to the dmd display, since as we get deeper into the machine config, we want all the content (the slide_player, etc.) to show up in the DMD display. Once you have your displays configured, the next step is to create the slide that will be shown in the window. In this case, the slide will only have a single widget, and that widget will be the Color DMD widget which will be used render the virtual DMD into the window. We decided to name this slide “window_slide”, though you can name it whatever you want. Note that in this case, we set the width and height of the color_dmd widget so that it’s the same size as the window itself. This is what causes it to be scaled to the full size of the window. We do not set the number of dots in the DMD here, as that’s automatically pulled in from the dmd display setting. We also do not need to set a source display for the color_dmd widget since it will automatically use a display called “dmd”. Next, we need a slide to show in the DMD itself. This is just something we’re setting up here as an example “first slide”. In your actual game, this slide will be ever changing and will reflect what’s happening in your machine. There’s nothing special about this slide. We just added a text widget and two colored rectangles. Finally, we need to create a slide_player entry which will cause the two slides we just created to be shown. In this example, we’re using the init_done event since that’s the event that’s posted by the media controller once it’s been initialized and ready to go. Since the DMD display is configured to be the default, when you use the slide_player in the rest of your game, you won’t have to specify target: dmd. We just included it here to make it clear that we were targeting the window slide to the window display and the dmd slide to the dmd display. Finally, remember to check the documentation for the display widget and the color_dmd effect for a full list of the options you can use to fine-tune how the DMD looks in the window. For example, you can configure the pixel size, the glow radius, the color of the space between the pixels, gain, tint, etc. You can also use the widget sizing and positioning to create a DMD widget that is pre-positioned at a certain spot on the display. This is useful if you have a standard size LCD monitor in your backbox but only part of it is visible to the player. In that case you could make a color_dmd widget that was the size of the viewable area and use the widget positioning settings to align it to the area of the display that was visible. You can also use the various window: options (such as full screen) to properly align the content of the display with the visible area. Finally, even though this example was using the color_dmd widget, you could replace it with the display widget with a dmd effect for a single color look instead of full color.